This week has been crazy, my brain melted a little as I worked on filters, it melted a little as I worked on LDAP and it melted a little more as I tried to trick Eric into working on filters with me (yes, that actually worked :-). Anyway, as usual, this is just going to be a summary of what we did as tons of little stuff have been committed here and there. You can keep track of the changes by checking the commit log of our Github mirror, or by joining our little gang on our IRC channel: #OpenSMTPD @ freenode. Snapshots containing all the following features should be published tomorrow. I had started working on LDAP support for OpenSMTPD a long time ago but for some reason the support was never finished and ended up rotting in my sandbox. A few months ago, I brought the bits back to a git branch so that I would keep running into it every few days as a reminder that I should not slack. But since I’m not too much of a LDAP fan, or a LDAP user for what it’s worth, I made the branch public in hope someone would pick it up and move it forward. A poolp user had started bringing the bits up to date and getting a working support in shape for aliases lookup. Resuming from there I simplified the code further and added support for almost all kinds of lookups making OpenSMTPD capable of using LDAP as a backend for the most common use-cases. The support is functional but it needs to be improved further as it currently has two drawbacks: the backend does not reconnect to the LDAP server should it lose the connection, and it uses the aldap synchronous API which means that queries that take time to complete will be heavy on the lookup process. Eric has plugged the K_SOURCE lookup service to relay rules, this allows OpenSMTPD to perform a lookup of the source address it should use when the transfer process establishes an outgoing connection to a relay. Until now OpenSMTPD could not force the IP address it used for outgoing trafic without relying on a hardcoded hack that was committed to the poolp branch. It was done this way on purpose and we delayed this feature until the other parts were rewritten appropriately for the puzzle to fit right. If multiple addresses are provided, they will be cycled through, and the mta code will detect which ones are no longer usable. A feature we had a long time ago and which disappeared during a cleanup was the support of intermediate bounces. When OpenSMTPD fails to deliver a mail it has to notify the sender that the message was never delivered. It sometimes happens immediately, but sometimes the failure may be temporary and the daemon keeps the message and tries to deliver it every now and then (ok, the logic is slightly more complex, but you get the idea). In such cases, the bounce will not be sent before OpenSMTPD gives up on trying after 4 days by default. Obviously, getting a mail 4 days later to tell you that no one read yours when you assumed it was already in the recipients mailbox for a while is quite irritating. The intermediate bounce will instead notify the sender that an error occured after a few temporarily failed deliveries, and let him know that the daemon will keep trying to deliver for a while. The keyword may change, but the idea and code is here and working. The feature was hidden and undocumented, it had uses but so limited that I did not want users to start using it in random situations that I would have to cope with later. Basically, a listener may tag all sessions initiated through it; then rules may apply to specific tags allowing some rules to apply only to some sessions. Eric realized that this was perfect to deal with one of our use-cases: DKIM signatures. We want DKIM signatures but we don’t necessarily want to write a filter for that as there are already tools that do the work. So we need to accept a message, pass it to a DKIM signing tool, which will in turn pass it back to us, so that we can send it where it needs to be sent. Now if I were to send mail to my gmail account, I would connect to the daemon, my session would not be tagged so it would match the last rule causing the message to be send to DKIMproxy. DKIMproxy would then relay back the mail to my loopback interface on port 10029 which would have the new session tagged DKIM causing the first rule to be matched. 4 lines. ridiculous. 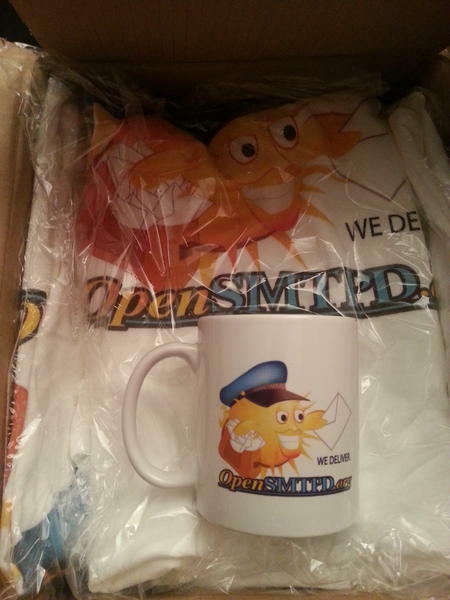 Here it is, OpenSMTPD goodies, not for sale, limited to friends and a few spare I will give away or sell at low price depending on how many are left. Time to go zZz, stay tuned for more news !